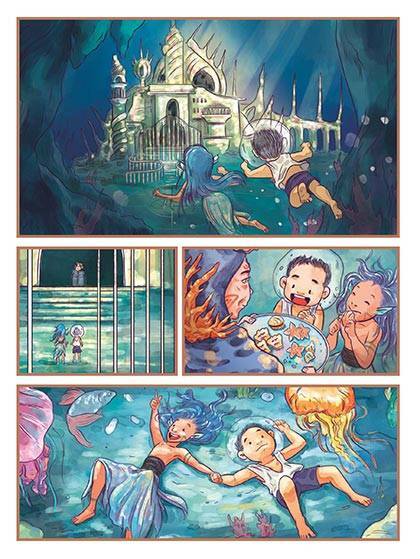 Cosmo.ph interviewed ‘Doorkeeper’ illustrators Bianca Lesaca and Gia Duran. 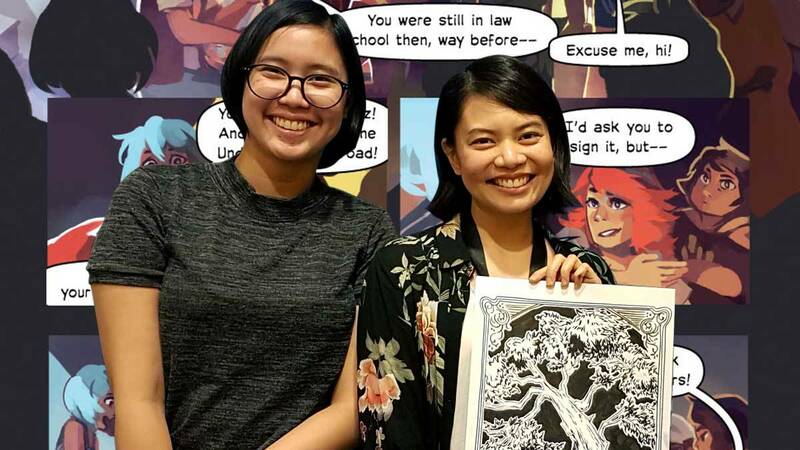 Meet two talented, Filipina illustrators: Bianca Lesaca and Gia Duran. Most recently, you may have seen their works published in Doorkeeper, a graphic novel by Ethan and Scott Chua. Bianca and Gia dish about what it's ~*really*~ like to work in the comic industry—including the biggest misconception they want to reject about being female illustrators. Bianca: I got my start in 2008 when a super random post I made on DeviantArt was noticed by Zach Lucero, and he asked me to illustrate the cover of his solo album ("Fall Crash Infect"). After that, I did a few more album illustrations for local bands like Sleepwalk Circus ("The Great Secret Show"), Encounters with a Yeti ("Pilot"), and The Ringmaster ("Delusion of Reference"). I really enjoyed the collaborative work ethic but couldn't reign it all in while juggling the other freelance gigs in graphic and web design—of which I was mediocre at. It was more of a survival effort with very little long-term focus, and I got restless. I knew I really wanted to paint and draw full-time but didn't have the exposure, access, or confidence to take the leap so I went back to school. In 2010, I took a summer residency in New York, which really allowed me to see how I felt about actually living/working as an illustrator. Then in 2013, I went to the Savannah College of Art and Design in Hong Kong for my second degree in illustration. During this time, I worked hard on sorting myself out with foundations and understanding the professional side of illustration. I [eventually] interned for Walt Disney Imagineering. My interest in narrative illustration later opened me up to exploring concept and sequential art. So when I moved back to Manila in 2015, I hit the ground running to make up for my years spent in training. I illustrated books with OMF-Literature and Adarna, as well as published two books and an editorial series from Hong Kong. 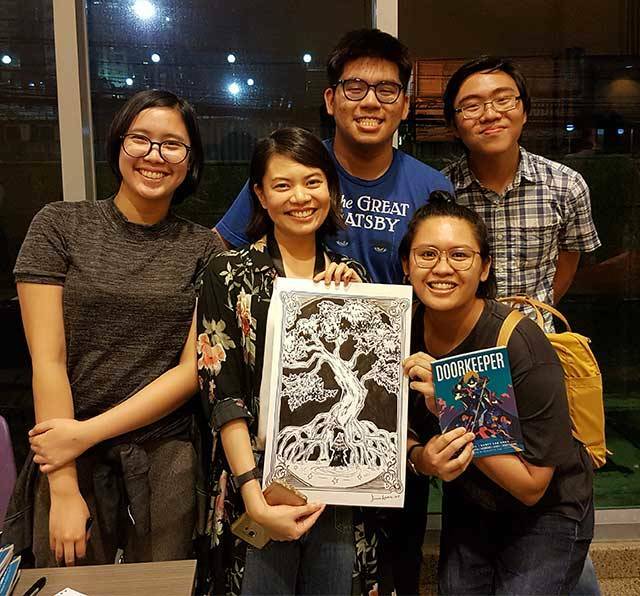 I joined Ilustrador ng Kabataan, tried my hand at game development, and participated in local comic conventions like AsiaPop ComiCon—where Scott Chua and Ethan Chua saw my work. Gia: Well, my first serious comic, "Heart On Your Sleeve," was actually for a class. The professor told us to create a short children’s story book with a maximum of 20 pages, and I asked if I could do a comic instead. She agreed, but I started doubting my decision when I was still coloring in my first 10 pages while my classmates were already done! I ended up passing it late because I had vastly underestimated how much time would go into making it. Two years later, I got roped into selling at Indieket, a comic convention for those who are just starting out in the comic industry, and I decided to print out copies of "Heart On Your Sleeve" because I didn't have any other comics to sell. To be honest, it didn't really sell that well then, and continued to not sell well until a year later at Komiket. 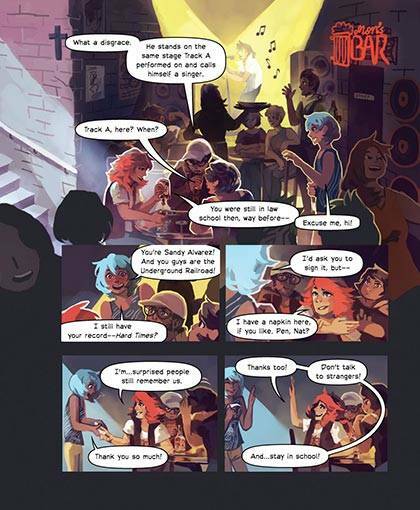 The administrators of Komiket made a post in their event page that had a list of their recommended student comics, and my comic was apparently one of the ones picked out! Now I'm doing my best to create them on a regular basis, and I'm glad that I do! B: I work from home so I'm pretty much the master and commander of my time. There are great perks like I don't have to deal with Manila traffic—which is always extra nice. The con is that I run my business solo, so it's a lot of managing disciplines and compartmentalizing, and when things go south, I have to deal with it myself. Domesticity of the workplace and a lot of flexible time can also take their toll on anyone, so I've had to establish routines and boundaries to give myself structure. I separate my work area from my bedroom and other personal living spaces, and I do my best to mimic the working schedules of regular employees (i.e. keeping to day shifts and having the weekends off to rest). Of course, there will always be overlaps within freelance. Sometimes crunch time does mean late nights, no weekends or holidays, and a dwindling social life, but it's all part of the territory. For the most part, I'll always work to reset my routines and internal clock whenever things go a little haywire. This allows me to anchor myself to an ideal setup which maintains overall well-being and sustainability on the job. G: I'm still a college undergraduate so my life right now consists of going to classes and doing activities for student orgs. My weekends are reserved for church service and freelance work.I usually start [my freelance work] in the afternoon. Before I start, I play a podcast or a long Youtube video playlist on a separate window so that I can work on the illustration for longer stretches of time without getting bored. B: Keeping your spirits up through long hours of isolated work is a real challenge. Many artists don't often talk about developing personalized habits for self-care, but it's actually integral to maintaining a focused work ethic. G: For comic-making, the hardest part for me has always been storyboarding and thumbnailing the comic. This is the part where you plan the pacing, spacing, and blocking. This part needs your absolute focus. I find that the actual drawing, coloring, and rendering parts a lot easier because even if it takes a lot of time to do, I could always play something in the background to entertain me and keep me engaged in my work. What are some stereotypes or misconceptions you’d like to debunk about women who are into comics? B: There is a misconception that all women draw with a "girly" style and/or are only attracted to "emotional, sensitive-chick” themes which really works as a double-edged sword for everyone. "Feminine art" or "emotional themes" do not necessarily represent a woman's hand or dictate her interest in comics. Likewise, "muscular, heroic art" or "gritty, serious themes" don't always represent a man's emotional range or his creative need for sparkles. It is true that some content are marketed with a particular theme or visual style based on gender—as seen in shoujo and shounen manga for instance—but these act more as observable, thematic classifications than an actual rule for segregation. G: While I could express my opinions on the state of the male-dominated superhero fanbase, there are people better equipped than me to discuss that. Instead, I'll talk about this in the stance of female content creators. A stereotype I'd like to refute would be that female comic creators can only create cutesy zines, and soft, pretty, romantic comics. First of all, there's a wide variety of comics that female artists are capable of: the honest, almost poetic, comics of Mich Cervantes, the mystic writings of Jonette Valenciano, the funny as hell sabog comics of Hulyen, and the genuine characters in the fantasy stories of Motzie Dapul. While the comic scene may still have more male than female comic creators, the women who are already in the comic scene bring extremely varied stories with them. Secondly, there's absolutely no shame in a female creator creating cute and soft content and it shouldn’t be dismissed as unimportant just because it isn't gritty or absolutely tragic. Take for instance Rebecca Sugar, creator of Steven Universe, who also have her fair share of emotional comics, but whose current show is about a boy who's mostly a pacifist and who learns life lessons through an optimistic dad and three magical women. Tell us about your work in Doorkeeper. B: I illustrated Chapter 2, which is set in World War II era Philippines, and the Interlude, which is set in a kind of displaced time-capsule. Ethan first approached me with the idea of the book after seeing my work in APCC 2016. I thought the concept was very interesting and I was later introduced to Scott who showed me the scripts and existing concept art by Allen Geneta. I had been meaning to work on a published comic so I was very eager to work on Doorkeeper. To my benefit, my previous experiences with book illustration really helped me stay organized and on task. It was also great to work with Scott and Ethan, who were both so supportive and trusting. Their script was also written with much poignancy and clarity that visualizing the pages were made easier to grasp. I was pleased the authors approached me for my natural storybook work, and that tactic really made sense towards Chapter 2's production, where my digital watercolors were set to complement the narrative’s emotionality and nostalgia. G: I covered Chapter 4, the chapter for Malate in the middle of the book. I planned it so that each scene has a different color palette, and that the dark violet/red would become the color marker for the scenes that veer towards revolution. On another note, I really didn't want to use lines to outline the borders of the panels at that time. I had unwittingly given myself a very hard time while I was coloring everything because I didn't want to give up and make panel borders. In retrospect, I should've just put borders to save myself some heartache. All in all, it was a very challenging but rewarding project to be part of. It was also such a pleasure to work with Ethan and Scott because they are such patient, talented individuals. I expect a lot of even greater works from them in the future.